International IPOH Fashion Week 2017 (IIFW™ ’17) is the 1st ever international fashion event to be held in Ipoh, a vision inspired by Founder Mr. Louis Sebastian and wife Ms. Adeline Khan. In conjunction with Visit Perak 2017 World Of Wonders campaign, IIFW™ ’17 is set to be an annual KEY event in Perak. With an exclusive line-up of fashion designers, models, celebrity guests and performers of both local and international stature, along with a unique concept and venue for a fashion show, IIFW™ is carving its niche of being a marque fashion event in Malaysia. The inaugural IIFW™ ’17 will be held over 3 days from the 6th to 8th October 2017, is a prelude to a grand fashion week event for 2018. 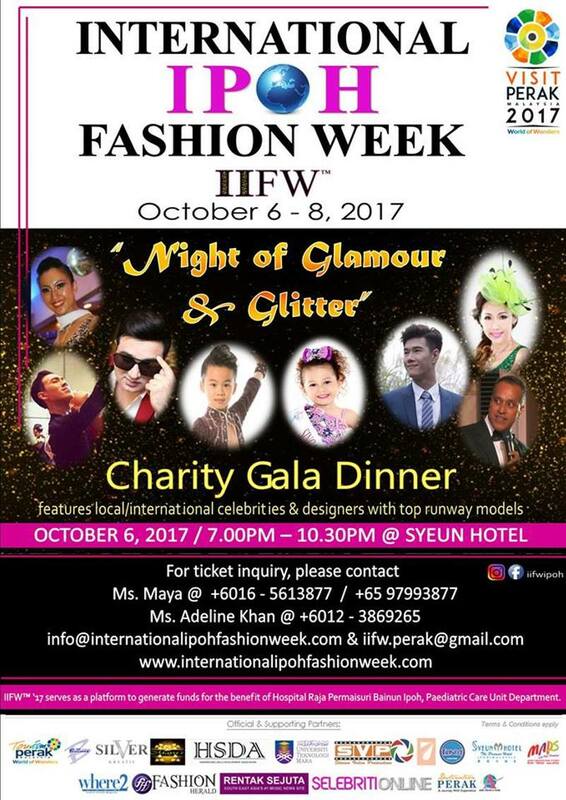 IIFW™ ’17 Opening “Night of Glamour and Glitter” Charity Gala Dinner will be held at Syeun Hotel, Ipoh on the 6th of October. IIFW™ ’17 Runway Fashion Showcase Nite 2 will feature Islamic Fashion and Modern Cultural Fashion, held at Syeun Hotel, Ipoh on the 7th October, starting from 8pm until 11pm. IIFW™ ’17 will have its unique Closing Runway Pret-a-Porter (ready-to-wear) Fashion Showcase on the 8th of October at Asia’s 1st Animation Theme Park, Movie Animation Park Studios (MAPS) at Bandar Meru Raya, Ipoh. Our main objective is to showcase Perak-based fashion talent to the world and welcoming the world to the wonders of Perak. 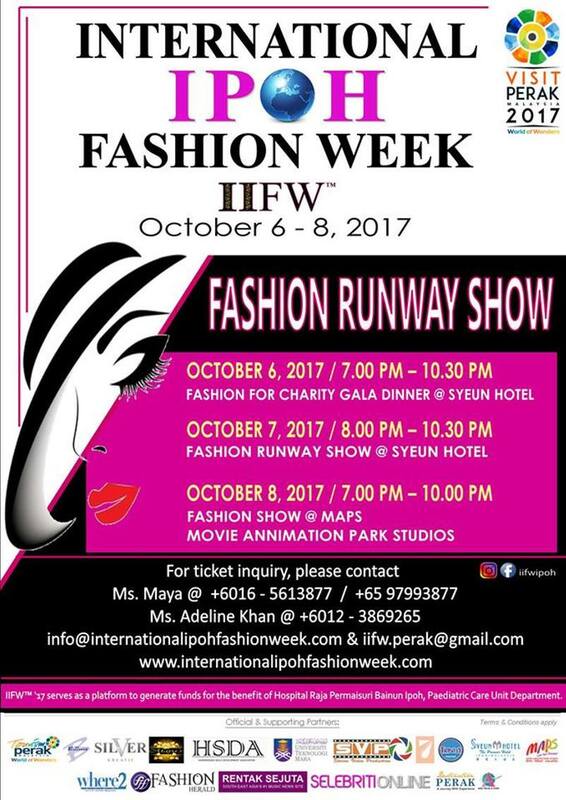 IIFW™ ‘17 also serves as a platform to generate funds for the benefit of Hospital Raja Permaisuri Bainun Ipoh, Paediatric Cancer Care Unit. Our target is to raise a substantial amount in order to purchase appropriate and adequate equipments, volumetric perfusors, syringe perfusors, 4-6 channel monitors and automated blood analysers. All financial contribution will be acknowledged on the day of event and printed in our Souvenir Program book. Schedule subject to changes depending on the number of participating designers.